IN ONE YEAR THE INTERNATIONAL ICE PATROL sighted no fewer than 1,351 icebergs. This patrol, under American command, was begun in January 1914, a sequel to the 1913 International Conference on the Safety of Life at Sea. The necessity for such a patrol was realized after the Titanic disaster, April 1912. The iceberg danger to transatlantic shipping is greatest in the neighbourhood of the Grand Banks of Newfoundland. DURING the period of more than twenty years since the International Ice Patrol has been established, not one life has been lost through a ship colliding with an iceberg in the North Atlantic. This creditable record is mainly due to the work of the patrol in locating bergs and sending news of them by wireless to all ships; it is due also to the efficient look-out. Icebergs are among the most dreaded dangers to navigation, particularly in the North Atlantic Ocean, because at certain seasons of the year they float south athwart the shipping lanes. The Labrador Current brings the bergs down from the Arctic. In the days of sail most vessels on the run between Europe and North American ports were too far south to be in danger; but the steamship routes were more direct, and ships were lost by striking icebergs. The worst disaster on record was the loss of the White Star liner Titanic on her maiden voyage on the night of April 14-15, 1912. She struck an iceberg in latitude 41° 46' N., longitude 50° 14' W., 825 passengers and 673 crew being lost. The Titanic, of nearly 60,000 gross tonnage, was at that time the largest ship in the world, and was reported unsinkable. She struck the berg a glancing blow that, ripped open her starboard side. Many lessons were learnt from the disaster, one being the necessity for an International Ice Patrol, On the anniversary of the disaster a memorial service is held aboard the vessels on patrol. The iceberg danger is perhaps greatest in the vicinity of the Grand Banks of Newfoundland. Great bergs, sometimes several miles in length, become detached from the Arctic ice-field and begin to drift south. On the way, they come into warmer waters and begin to melt and to “calve”, breaking up into smaller pieces. Bergs two and a half miles long and over two miles wide have been observed, and one seven miles long has been reported. As only about one-ninth is visible above water, the weight of these floating mountains is enormous. One such berg, with a height of about 150 feet above water, would weigh some thousand million tons. All the time, however, it is melting below water. Then arrives a time when the mass, becomes top-heavy and turns over with an awesome crash, to begin another stage in disintegration. If the mass above water is high and white the danger is not so great. In daylight and clear weather the berg will be seen for a fair distance and avoided; in fog the cold mass will chill the air and warn the experienced mariner; and in rough weather the sea will break round it and give audible as well as visible warning. Some mariners claim to be able to smell icebergs - but not when the bergs are in the most dangerous stage of all - awash. Only those who have had experience of ice realize its terrible power; even in temperate waters ice-floes coming down on the tide or with the current will cut through the skin of a small vessel and rapidly sink her. When under way in such conditions the wisest plan is to drift with the ice when the floes are thick until a lane opens. Then the navigator can proceed slowly and cautiously under steam, keeping a sharp look-out and stopping his engines when the lane in the ice narrows. He thus creeps cautiously out of danger to the open sea. IN MEMORIAM. Members of the crew of an International Ice Patrol coast-guard cutter firing a salute in memory of the 1,498 lives lost in the Titanic disaster. The salvo is fired annually over the place where the ship of nearly 60,030 gross tons foundered after a collision with a huge iceberg in latitude 41° 46' N, longitude 50° 14' W.
On several occasions ships or the crews of shipwrecked vessels have anchored to icebergs or have taken refuge on them and so drifted to safety. On May 8, 1854, the Resolute, one of the vessels of Sir Edward Belcher’s expedition in search of traces of the Franklin expedition, was abandoned in Barrow Straits, north-west of Baffin Island, Canada, about latitude 75° N. and longitude 95° W. She was picked up sixteen months later off Cumberland Sound, in the south-east of Baffin Island, in latitude 67°, after having drifted some 1,100 miles. The Fox, in which Captain M’Clintock reached the spot where the Franklin records were buried, was frozen into the pack ice from August, 1867, to April, 1868, after which she drifted 1,385 miles in 242 days. The exploration ship Polaris, which set out from Connecticut to explore the north-west coast of Greenland, was frozen into the pack-ice in September, 1872, in latitude 79°, near Smith Sound. The following month nineteen persons, alarmed by a storm, left the ship and took refuge on the ice. The ship and the floe were separated in the storm; those on the ice were unable to get back to the ship. Among the party thus marooned were two Eskimos and their wives and children, including a baby only a few weeks old. They had two boats, some hams, pemmican, biscuits, chocolate and tinned meat. They shot birds, seals and one bear, built snow-huts and made a fire of seal-blubber. Pieces of the floe broke off at times, and once the party took to the boats, but came back to the ice. They were rescued by the steamship Tigress on April 1, 1873, in latitude 53° 35' N., having been on the ice for 197 days, and having drifted 1,700 miles without the loss of a life. Because of their size icebergs often reach currents below the surface of the sea which are counter to the surface currents. In fact, one explorer, Dr. Kane, took advantage of this fact by anchoring his ship to an iceberg, and thus was pulled north against the wind and the surface current. DURING SPRING AND EARLY SUMMER the ice menace in the North Atlantic is at its greatest. The International Patrol keeps in daily touch with the bergs, determines their set and drift, reports to the U.S. Hydrographic Office and broadcasts to ships. The patrol also gives any assistance required by ships and carries out scientific observations. Green and blue colours are often seen in the icebergs of the North Atlantic. The bergs which break away from the glaciers carry earth and stones which they later deposit into the Atlantic. In the ’nineties Fridtjof Nansen, the Norwegian explorer, proved that the Arctic ice-cap is constantly shedding bergs which drift south into the Atlantic, and that the Arctic Ocean is not shallow, but of considerable depth. The slow ships of the early days of steam steered across the Grand Banks, and ran the gauntlet of the bergs during a large part of the year. 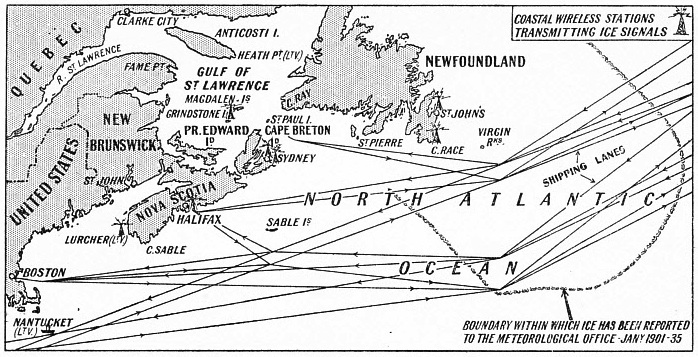 When speed improved the principal shipping lines agreed to follow definite courses south of the normal ice zone. This question of keeping ships out of the track of danger on the routes from Europe to the United States was first considered by Lieutenant F. M. Maury, of the United States Navy, who was a navigational genius. To lessen the danger of collision, he suggested, in 1855, that ships eastbound should follow routes different from those taken by westbound vessels. His suggestion was not adopted for twenty years, the first company to lay down specified routes being the Cunard. This was the real beginning of the shipping lanes, and various alterations and improvements followed. Seasonal tracks were established which varied according to the month and the condition of the ice. But the Titanic disaster showed that this safeguard was not adequate in abnormal conditions. After the loss of the Titanic, the United States Government and the British Board of Trade took steps to deal with the peril. Two U.S. Navy scout cruisers patrolled the ice regions in the danger months of 1912, and in the 1913 season the work was performed by the two U.S. Coast Guard cutters Seneca and Miami. The British Government called a conference of various shipping companies early in 1913, after which the auxiliary whaler Scotia, which was then over half a century old and known as a reliable little ship, was chartered and fitted out for the service. The cost was divided between the Board of Trade and the British shipping companies operating transatlantic services. The Scotia’s work was confined to ice and weather observations off the Newfoundland coast; and, although she was hampered by fog and storm, she rendered good service. She cooperated with the two U.S. cutters in sending information to ships. THE WIDE REGION guarded by the International Ice Patrol is shown on the this map. Vessels of the patrol guard the south-eastern, southern and south-western limits of the regions of icebergs near the Grand Banks in the ice season. During the rest of the year they observe ice conditions and search for derelicts. The main duty of the officers of the cutters was to locate bergs and warn passing ships. In addition they had to study the ice problem, particularly in connexion with the currents near the Grand Banks; the properties of the ice, its drift, erosion and melting; the temperatures of the sea and air near the ice; and the habits of birds and seals in relation to ice. They were further expected to gain all information which could be of aid to mariners. Towards the end of 1913 an International Conference on the Safety of Life at Sea met in London, and the present International Ice Patrol came into being, as a result, in January, 1914. This has been in operation ever since, except for the years 1917 and 1918 when the United States were at war. The primary duties of the patrol are derelict destruction, ice observation and ice patrol service. At first the service, consisted of two vessels which patrolled the ice regions in the danger season and tried to keep the shipping lanes clear of derelicts during the rest of the year. The management of the service was undertaken by the United States Coast Guard Service. Work began in 1914, and a later convention in 1929 defined the present arrangement. Fourteen countries contribute to the cost, the British contributing 40 per cent, the United States 18 per cent, Germany 10 per cent, and other nations smaller proportions according to their quota of Atlantic traffic. The vessels take all possible steps to destroy or remove derelicts found east of a line drawn from Cape Sable (Nova Scotia) to a point in latitude 34° N., longitude 70° W. Up to three vessels are provided. In the ice season they guard the south-eastern, southern and south-western limits of the regions of icebergs near the Grand Banks, and during the rest of the year they observe the ice conditions and search for derelicts. In the spring and early summer the iceberg menace is at its greatest, and the patrol keeps in daily touch with the bergs and field-ice to determine their set and drift. It reports to the U.S. Hydrographic Office, broadcasts to ships and helps vessels in distress. The cutter Seneca made a name for herself as a kind of super-lifeboat of the Atlantic before she was relieved in 1922. Among her valuable work, in May, 1914, she picked up a ship’s boat containing First Officer Thieres and three men who had been adrift for fourteen days after the loss of the British steamship Columbian. After she had been withdrawn from the Ice Patrol she patrolled Rum Row, and later searched for the lost Liev Eriksson, the yacht belonging to William Washburn Nutting, a famous American yachtsman, which vanished with him and three companions in 1924 while on a voyage across the Atlantic. The loss was one of the mysteries of the sea. Conditions vary from year to year. Generally the patrol vessels work in hazardous conditions. 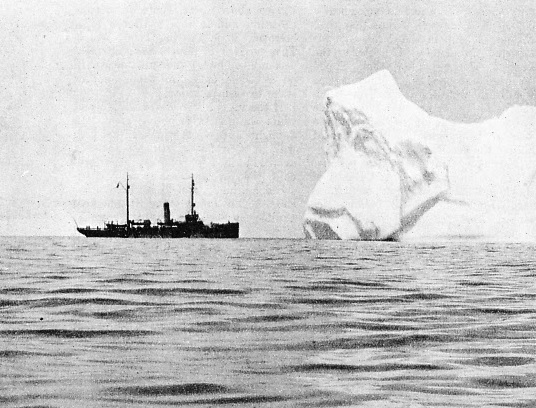 In the 1931-2 season the Ice Patrol began work in March, with three observation cruises near the Grand Banks, despite severe and stormy weather. On March 28, no fewer than twenty-live icebergs were reported east of the Grand Banks, and the regular ice patrol was begun. Between January 1 and July 2, 1932, it was estimated that 528 bergs drifted south of Newfoundland. Three oceanographic cruises were made during the season, and three current charts were drawn of the ice regions, these charts being used by the cutters to determine the probable set and drift of the bergs. The observed drifts coincided with the reputed currents. In the following year the U.S. Coast Guard vessel General Greene was sent, up first to locate the icefields and icebergs; her call letters were notified to all vessels in the North Atlantic, and these were asked to report to her any icebergs sighted. When the ice drifted south and made constant patrol necessary the cutters Champlain and Mendota began the patrol alternately. In 1934 the cutters General Greene, Pontchartrain and Mendota performed the service, the General Greene opening the service, sailing from Boston on April 2. On April 24 the Cunard White Star mail liner Georgic sighted twenty bergs and numerous growlers; (small icebergs) while crossing the Grand Banks from west to east. On June 12, in Davis Strait, between Baffin Island and Greenland, a berg seven miles long was reported in latitude 62° 53' N., longitude 60° 45' W. This huge mass ol ice bordered an icefield which extended as far as could be seen. 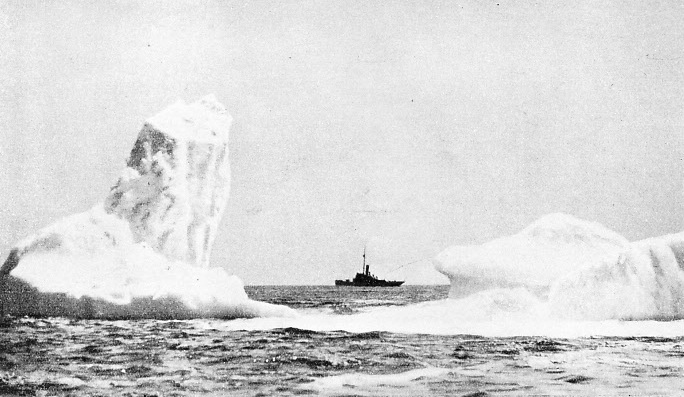 The Ice Patrol sighted about 600 bergs near the Grand Banks in the 1934 season. The record, however, up to the time ol writing is 1,351 icebergs seen in 1929. Three shipping tracks, revised in March, 1931 have been established between Europe and the United States, and four between Europe and Canada They are used by the ships concerned according to the season of the year. BLOWING UP A BERG. The crew of an Ice Patrol cutter watches the effect of high explosives on a floating mountain of ice. Although the work of the Patrol began in 1913, a later convention in 1929 defined the present arrangement under which the management of the service is undertaken by the U.S. Government. Fourteen nations, including Great Britain, contribute to the cost. Click here to see the photogravure supplement to this article. You can read more on “Adventures of the Ice-Breaker”, “The “Chelyuskin Rescue” and “The Franklin Mystery” on this website.